HANGTIME – Knott’s Berry Farm’s (Dive) Infinity Coaster for 2018! Knott’s Berry Farm will welcome HangTime, a brand new steel rollercoaster – and the only dive coaster on the West Coast – to the theme park in the 2018 summer season. HangTime will tower 150 feet over the Boardwalk area, showcasing gravity-defying inversions, mid-air suspensions and twisting dive tracks. HangTime will send riders up a vertical lift hill into a raised 96-degree drop – the steepest drop in California. The coaster’s train will come to a halt once the highest peak is reached, and will leave riders suspended at the crest for several seconds at a 60-degree angle, giving the illusion of a disappearing track. Then the train will suddenly descend in a beyond-vertical drop, through 2,198 feet of steel track and five gravity-defying inversions. 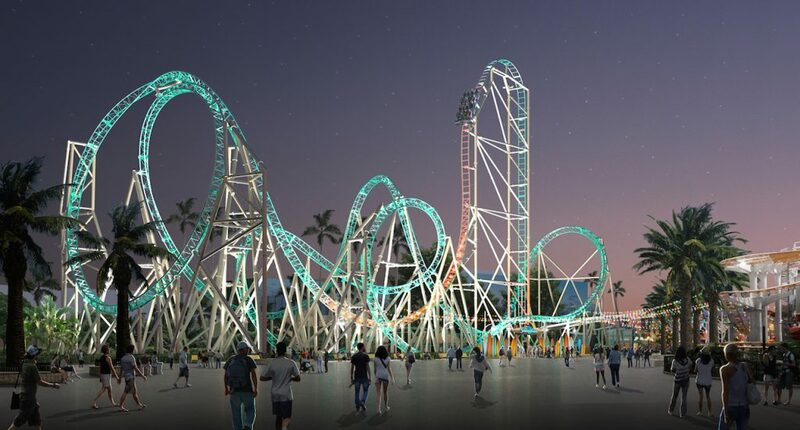 HangTime will be only the second rollercoaster in the Western Hemisphere to feature a negative-g stall loop, which gives riders the sensation of floating. HangTime’s ride structure itself will come to life and illuminate the Boardwalk area with colorful nighttime track chase lighting that will accompany the coaster train’s travels across the smooth steel track. The coaster continues Knott’s legacy in rollercoaster innovation and industry firsts; the park introduced the very first corkscrew inversion rollercoaster with Corkscrew, and the first flywheel launch coaster with Montezuma’s Revenge. HangTime is manufactured by Gerstlauer Amusement Rides, GmbH, and is the company’s next-generation “infinity coaster” model. We’re very excited for HangTime, which’ layout and color scheme will pay homage to legendary coasters and attractions that once stood in its place, such as Hammerhead, RipTide, Corkscrew and Boomerang. HangTime will feature three, new generation Infinity trains from Gerstlauer, which seat 16 people in total, 4 rows of 4. The ride’s anticipated hourly capacity is 800 riders, and the ride does not feature any mid-ride blocks. The stall on top of the tower will be 4 seconds long and to prevent the slow sliding over the edge, the park has opted to NOT use magnetic braking, but instead a traditional holding brake for the dive, that will hold the car still in place for 4 seconds. The rest of the braking on the ride will be magnetic, including the anti-roll back braking. Which is revolutionary in its own right, if the train gets stuck on the newly-innovated lift hill, the vehicle will slowly slide down the magnets and stall at the bottom of the vertical lift, where it is safe to evacuate. The ride features 5 inversions including a very unique airtime dive into the first inversion, riding over the top of the Immelman in a Top Hat style maneuver, before diving into the actual Immelman. Instead of the traditional idea of the drop being followed by an inversion, HangTime will provide some stellar airtime first. With lapbars of course. Speaking of lapbars, Cedar Fair installs seat-belts on all of their sit-down roller coasters, including HangTime of course. To speed up the boarding and dispatching, the seat-belts will have special tags that riders can pull to check the seat-belts, so the operators do not have to. In addition the park is considering adding lockers, as seen on new rides such as Fury 325 at Carowinds, to minimize the time spend on boarding. Guests of larger size should not be concerned according to Knott’s Berry Farm, since the average weight restriction is 350 lbs. Depending on how a guest carries their weight, some heavier or lighter guests may not be able to ride. Due to the confidence Knott’s Berry Farm has in the large-rider-friendliness of HangTime, there will not be a test seat. The color scheme was decided upon to keep the look of the boardwalk light while fitting the surfing theme, most importantly the park wanted to be able to play with LED lights at night, meaning the supports are white/light gray. HangTime will feature LED tracer lights as seen on Monster at Adventureland in Iowa, which will light up a few feet in front of the car as red and orange during the night time. These lights will be installed in the track in the factory by Gerstlauer and a 3rd party light supplier. Knott’s will not be installing these lights themselves. Nonetheless, the park is designing light packages for all types of events including Knott’s Boysenberry Festival, Knott’s Scary Farm and Knott’s Merry Farm. We think HangTime is the PERFECT Addition for Knott’s, as it is their first new thrill coaster since Silver Bullet in 2004. It pays tribute to classic and revolutionary coasters that stood in the spot for many years, and features elements such as the elevated corkscrew (to pay tribute to Corkscrew), the inverting Horseshoe which exits into a quick double-down, which end 5 feet below the boardwalk for a Cobra Roll finale (to pay tribute to Boomerang), into the brakes. We love the colors, love the name, and love the theme. Knott’s Berry Farm has got winner on their hands! Knott’s Berry Farm’s sister park in Northern California, California’s Great America, has just announced RailBlazer, read all about that new coaster, here! Wow! That ride looks awesome! Can’t wait to ride it sometime! Previous PostPrevious RAILBLAZER – A Single Rail Coaster Coming to California’s Great America in 2018!